We are located just a few miles west of the heart of historic downtown Aiken, just north of Augusta Aiken Road (Rt. 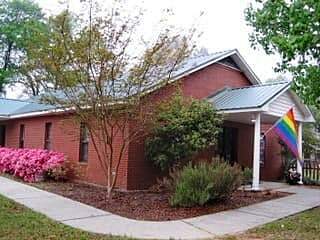 1/78) close to the University of South Carolina Aiken campus and Aiken Regional Hospital. Learn about the accessibility of our building and programs. 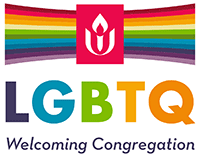 The congregation’s office is open Tuesday from 9:30am to 1:30pm and Thursday from 10:30am to 2:30pm. Contact our office. Take Interstate 20 to Aiken Exit 18. Turn SOUTH after the exit ramp. Head toward Aiken on Highway 19 South, which will become Laurens Street in downtown Aiken. In downtown Aiken you will see an intersection with a circle planted with flowers where Richland Avenue (Hwy 1/78) crosses Laurens Street (Highway 19.) Other landmarks on that corner include Plum Pudding (gourmet cooking and kitchen supply), a pink Aiken Pharmacy building, and the Hotel Aiken. TURN RIGHT onto Richland Avenue (1/78) heading WEST toward Augusta. Follow Richland Avenue past a motel on your right at the bottom of a gentle hill and head up the relatively steep Kalmia Hill. At the top of Kalmia Hill you will find a set of stoplights. TURN RIGHT onto Gregg Avenue between Pepper Hill Nursing Home and Shadow Oaks Nursing Homes. Continue on Gregg to the SECOND LEFT, which is Derby Lane. The Aiken UU Church is on the corner of Derby Lane and Gregg, facing Derby Lane. Follow Highways 1/78 toward Aiken. Cross the Aiken Bypass #118 and you will see a relatively steep hill ahead — this is Kalmia Hill. At the top of the hill TURN LEFT at the stoplight intersection onto Gregg Avenue. This turn is just past a firehouse and there are two nursing homes on either side of Gregg — Pepper Hill and Shadow Oaks.